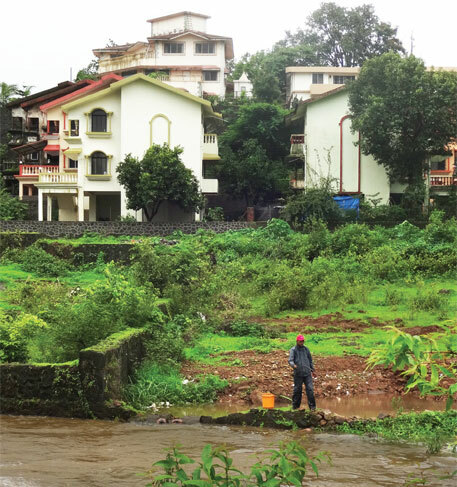 IT MAY BE farfetched to say that the tiny hill town of Lonavala will disappear under water. But the idea is not all that wild, considering that in the past 15-odd years, the popular hill station in the Pune district of Maharashtra has seen unprecedented floods almost every monsoon. A booming tourism business and the resultant spurt in construction, coupled with inadequate infrastructure, have blocked the natural waterways in the 38 sq km town. Taking cognizance of the situation, highlighted by the residents of Lonavala in a public interest litigation (PIL), the Bombay High Court in April this year called for a ban on all construction work in the hill town till the time it has infrastructure to support the growth. But the Lonavala municipality plans to challenge the order in the Supreme Court, even as residents continue to struggle with floods, inadequate water supply and poor sewage systems. The town has witnessed a dramatic rise in the number of tourists, especially after the Pune-Mumbai Express Highway was completed in 2002. The official population of the town is 100,000, but it nearly triples during weekends as tourists pour in from Mumbai and Pune. This has resulted in indiscriminate constructions. “As the number of tourists rises every year, more and more residents are tempted to convert their houses into guesthouses,” says advocate Tanu Mehta. The Lonavala resident is arguing on behalf of the Lonavala Khandala Citizens Forum who filed the petition in the high court. “Construction is happening on the beds of streams and precarious hills. Now even hilltops are being levelled to create space for construction,” she says. Lonavala is just a small town, but the number of structures it has is rather high, says a member of the Architects and Practicing Engineers Association of Lonavala. “Every month the municipality gives permissions to build 12-15 buildings. As many as 80-100 structures come up in a year,” he says. Tanuja Mukherjee, yesteryears’ filmstar and president of the Lonavala Khandala Citizens Forum, says the houses—many of them unofficial guesthouses—have been constructed right up to the edge of two large streams that meet in the valley. “Most of the real estate development takes place during summers when the streams are dry, so developers do not even know that they are constructing on a stream,” she says. “When it rains, constructions get inundated and the surrounding areas get flooded. People build walls to protect their properties. In the process, the waterway narrows down, sometimes to dangerous levels ,” she adds. 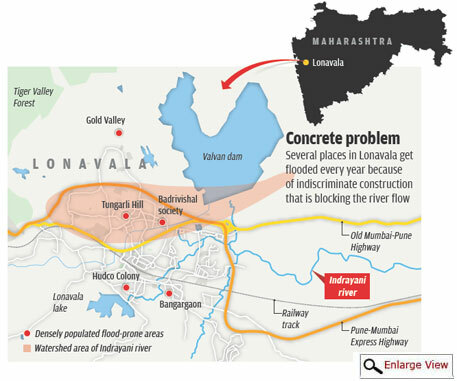 As a result, areas around the banks of the Indrayani river, Hudco Colony, Bangargaon, Gold Valley and the world famous Kaivalya Dham Yoga centre near the Mumbai-Pune Expressway get flooded every year, say residents (see ‘Concrete problem’). A 2011 hydrological survey conducted following court orders on the PIL shows that residential colonies are coming up very fast in areas such as Gold Valley and Tungarli Hill, where the gradient is steep and soil unstable. This creates the danger of flooding and landslides. Tungarli Hill, which is the origin of numerous streams that feed the Ulhas and Patalganga rivers, is covered with weekend cottages that block the flow of the streams. In the Badrivishal area, which is in the watershed of the Indrayaniriver, societies have blocked the flow of two large supplementary streams of the river. AmolPawar, assistant professor of construction management at the National Institute of Construction Management and Research, Pune, blames faulty construction for floods and water-logging. “Hudco Colony is situated just two metres away from the flood-line of the Lonavala dam,” says Pawar, who has studied the flooding of the area. While most agree that construction has done untold damage to the hill town, there is no way it can be regarded as illegal. Lonavala, a known hill station and a municipality since pre-Independence times, does not have the status of a hill station under the Maharashtra Hill Station Policy, 1996. The policy reserves 33 per cent of the area under development for open spaces and makes tree cover mandatory and restricts floor space index (the ratio of a building’s total floor area to the size of the piece of land upon which it is built) to 0.3. This apart, the height of double-storied structures cannot go beyond 9 m. Despite repeated pleas, the municipal body has made no attempt to declare the town a hill station. In 1990, the Maharashtra government had written to the Lonavala municipality to declare the town a hill station, but no step was taken. If Lonavala gets the official hill station status, the municipal body will have to make provisions to restrict construction and protect forests, waterways and hills, says Mehta. What’s also making construction easy is the Lonavala development plan. Sanctioned as late as 2006, the plan does not recognise minor streams. The land where they flow is being sold for construction of buildings. “The municipality is within its legal limits while granting permission to construct,” says Ganesh Shete, chief executive officer, Lonavala municipality. The 2011 hydrological survey found large-scale waterway blockages due to development and made strong recommendations to restrict construction and restore streams, says Mehta. It also asked for inclusion of the streams into topographical maps in the development plan. But the municipality did not make the changes to the plan, she says. To make things worse, the town’s infrastructure development does not match the construction boom. Its water supply system is primitive and the sewage system still depends on old-style soak pits and septic tanks. There is no mechanism to dispose of 20-25 tonnes of garbage the town generates daily but for a 2.4-hectare dumping ground that has been in use for 60 years now. Garbage heaps and blocked drains are common across Lonavala. “We have asked the government to give us land on ownership basis so that we can set up a treatment plant to treat 7-8 tonnes of garbage daily,” says Shete. Residents say the municipality has proved singularly ineffective in delivering when it comes to infrastructure. The PIL brought to light the fact that the municipality had never asked the government for infrastructure development funds. Even after the court ordered infrastructure development, the body failed to utilise funds effectively. Last year, a contractor who has a history of default was given the contract to construct a sewage plant. He absconded with Rs 1.5 crore. This year, a Rs 75-crore road construction project failed to see the light of day due to bickering within the body. The amount was returned to government. Shete, who confirmed the incidents, says new permissions have not been given after the court order. He, however, warns that flood prevention will be a tall order because it will involve undoing the damage inflicted by development over a decade and a half.